Having said that in my opinion it’s one of the few establishments in Montreux offering not only a preferred location directly by the lake but also nice enough rooms to enjoy the beauties of this near Mediterranean town. There are seven individually furnished rooms which can be described as quite luxurious but the time of their renovation dates a few years back. We had a Junior Suite Standard with view to the lake which is adequately sized and tastefully decorated; the bathroom is kept in 1980s-style, also the outdoor furniture. One has to mention that L’Ermitage has certainly one of the best restaurants in the proximity of Montreux (17 points guide Gault-Millau, 1 star guide Michelin). We ate there on both evenings and were very satisfied with the offered, although prices are steep. The cuisine is French style and rather classical, the food is impeccably prepared and the portions are not too small as this is often the case in comparable establishments. We would go back in a heartbeat although it’s certainly suited for a special occasion. 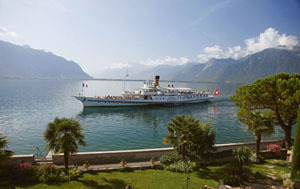 All things considered, L’Ermitage is a recommended place for a short stay on the Lake Geneva.